The Los Alamitos Griffins cheer on 2012 alum Sophia Aragon, who is now senior captain for the NCAA DI Fresno State Bulldogs. FRESNO, Calif. – As the paint dries, it gives the artist time to step back and study her work. The artist notices flaws and imperfections. If the artist could start all over, would she? In the case of women’s lacrosse senior Sophia Aragon, the flaws are what make the piece special and unique. The imperfections are lessons to be learned from and experiences that mold what’s to come. “I like that I can have an idea and see it come to life,” Aragon said. The defender has always been into art and is currently taking an art class at Fresno State that challenges her to try new things and be creative. She also makes her own beaded jewelry. The advertising major in the mass communication and journalism department plans to become a creative director at an advertising firm after graduation. 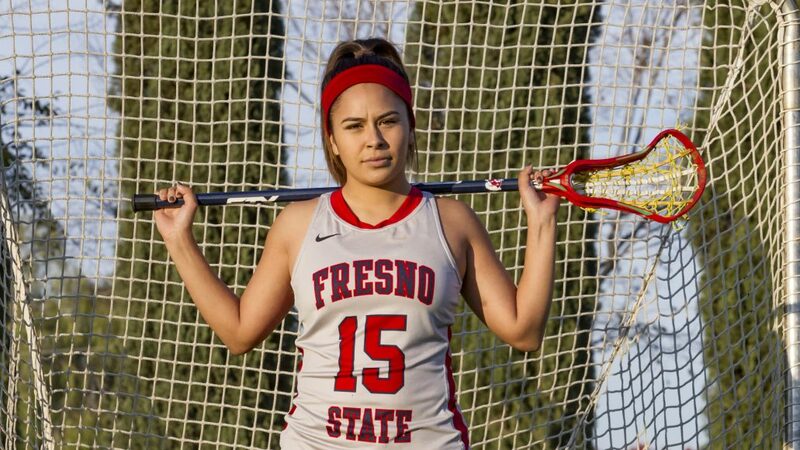 As the Southern California native shares her feelings, it becomes easy to see why she’s the Fresno State all-time record-holder in ground balls and is closing in on the record for most caused turnovers. It’s also easy to see how the team captain has helped lead the Bulldogs to their best start in school history. She loves the strategies, the movements and the plays. It’s clear that Aragon sees the game of lacrosse as a piece of art. One that she’s been creating for 10 years. When Aragon was 12 years old, she realized she wasn’t very good at softball, but wanted to play a competitive sport. She thought about volleyball and figured her five-foot-one stature would make her a perfect libero. But then she saw a sign for lacrosse. A new team was being created and she wanted to be a part of it. When she reached high school in Seal Beach, Calif., the lacrosse team was three years old and she knew she wanted to be a part of it. She was awarded the team’s Defensive Player of the Year honor after her junior and senior seasons and her team won California Interscholastic Federation championships in 2010, 2011 and 2012. 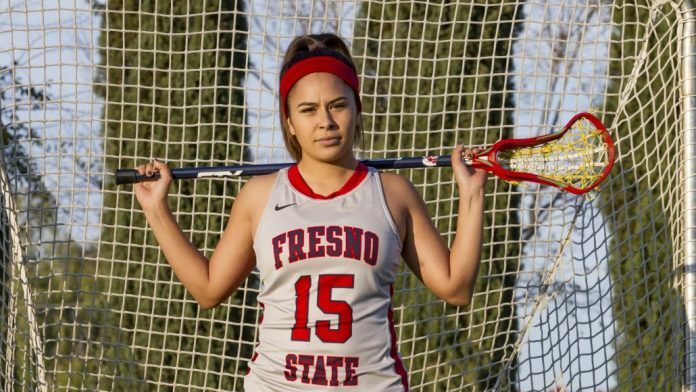 By the end of her junior year though, she was emotionally and physically drained, and she decided she wouldn’t pursue a collegiate lacrosse career. However, in the midst of her senior year, she realized she wasn’t quite ready to give up the sport she came to love. That’s when Fresno State head coach Jessica Giglio came into the picture. Giglio invited Aragon on an official visit to Fresno State and Aragon fell in love. For the entire article, visit GoBulldogs.com.